Refined, bleached and deodorized (RBD) fats and oils can be considered as a source of empty calories. We have developed a new way of minimally refining oils for health to minimize the losses of important micronutrients (tocopherols, phytosterols). This is not like a virgin oil, but a functional oil for the manufactured foods industry, with similar performance properties as RBD oils (low free fatty acids, degummed, bleached), but with enhanced nutritional properties. MRFH Canola, Soy and Cottonseed oils have been successfully produced with enhanced levels of micronutrients (don't tell vitamin and supplement companies!). This MRFH process does not require deodorization and is thus much more energy efficient and sustainable. Since deodorization is abandoned, the risk of creating toxic partial glyceride-chlorine derivatives during oil refining is minimized. 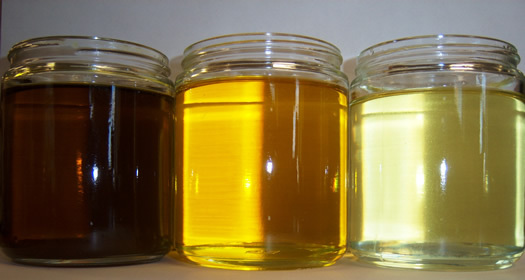 Crude canola oil is brown in color due to color bodies and other impurities. Conventional refining removes all of these (including some desirable nutrients), resulting in an almost colorless oil. Minimal refining yields a straw-colored oil that retains many of the desirable nutrients present in unrefined oil. Photo courtesy of Saeed Mirzaee Ghazani.